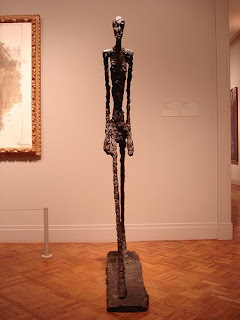 Alberto Giacometti, Walking Man, 1960, Bronze. An honest, unsettling sculpture of a man walking through life is Giacometti’s Walking Man. Although daunting, I thought this would be an impactful first sculpture for me to write up. This elongated, literally withering, body can be taken past the first impression and onto the deeper, troubling core this body symbolizes gorgeously. In this man's single step you can see his bronzed flesh pealing off in the sweeping motion and his face growing longer with pure desperation. There’s an inner struggle in the sculpture that is represented in a dramatic style. It’s rare to see someone this physically warped which therefore might bring the notion that the sculpture is unrealistic. However, internally there have been many times when we could, in fact, relate to this man. As if the world is pushing vehemently against us and we’re left hollow, we are the Walking Man. There’s not just the weighty aspect of the inner struggle but also the matter of fragility, both physically and emotionally. No matter how closed off or numb we are to the world, part of human nature is our fragile state. When we are stripped down to our core, purely our existence makes us delicate and easily broken down. Whether it’s the love of your life, your family or yourself, our trust in each is so brittle that one simple move can break us just as this sculpture appears. Like a mere toothpick, we are, eternally. It’s in Giacometti’s energetic, digging dashes that the sculpture opens an entirely shut off realm of our being. Walking Man represents the relationship that never had an ending and the internal struggle that we never make known.